At the far west end of San Francisco, just south of where Golden Gate Park meets the Pacific Ocean, lies a neighborhood where you can feel the laid back pace one would expect from a seaside surfing community. Out there the streets are wider and lined with cottages in a rainbow of pastels. The morning conversation at the local Trouble Coffee shop is less about the latest tech startup deal and more about the latest break at Ocean beach. This is the Outer Sunset, the small town within the big city. 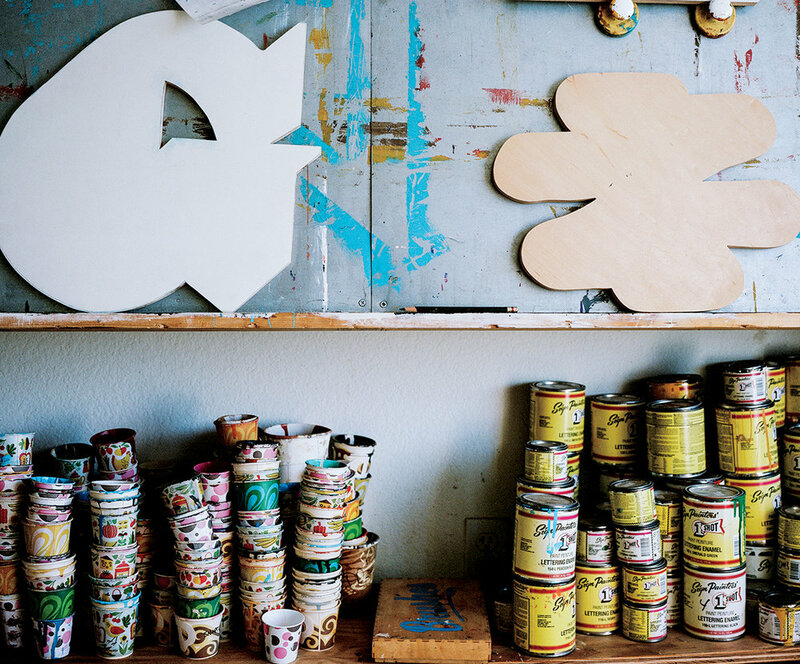 Down on Noriega and 44th street there’s Woodshop, a workspace and showroom to the collective woodworking talents of Jeff Canham, Josh Duthie, Luke Bartels and Danny Hess: a sign painter, chair restoration artist, furniture builder and wooden surfboard shaper respectively. It’s a sunny Friday afternoon The parade of guys and dogs return to the shop from a lunchtime surf break, still in their wetsuits, dripping wet, with a Hess board under each arm. “Being out here [in the sunset] is a fundamental part of who we are,” Luke says. The Outer Sunset has the surf culture and spirit of a California coastal town, without the attitude or competitiveness. The space, energy and sense of community of the neighborhood have undeniably impacted Woodshop. Visit the few local stomping grounds and it’s quickly apparent they’re just as much a part of what the neighborhood is; Jeff has painted the shop signs for half of the businesses there, including the iconic Mollusk surf shop, where Danny has his own wall to showcase his line of wooden surfboards and hand planes. 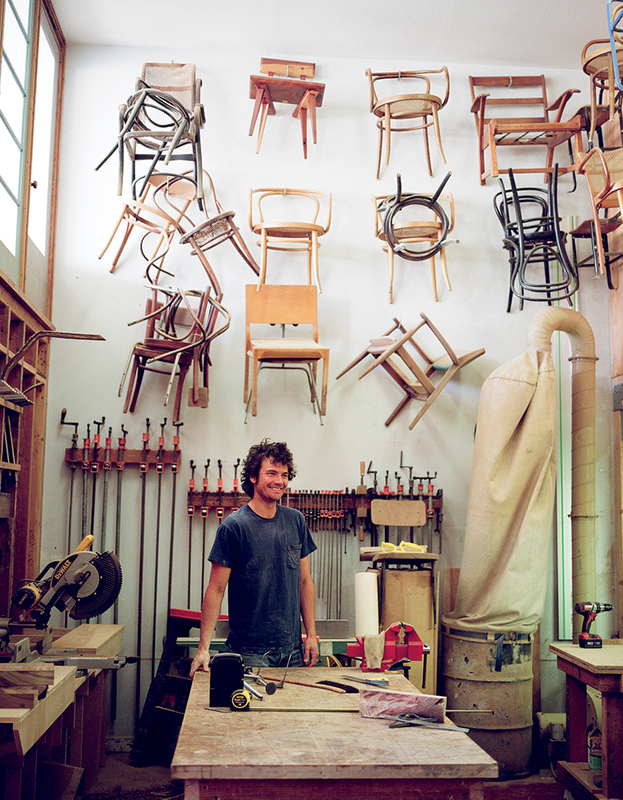 At the local bakery customers eat muffins on Luke’s outdoor furniture, and across the way at General Store his line of cutting boards sits next to Josh’s one of a kind reclaimed and reinvented vintage chairs. In the shop the guys return to their respective stations from the mid-day surf session, half the crew not bothering to change out of their wetsuits. “Nothing sells a board like a guy fresh out of the Ocean,” Danny jokes as the dust from his shaping bay starts to consume him. “Well, nobody’s ever bought a sign from me while I’m in a wetsuit,” Jeff laughs. 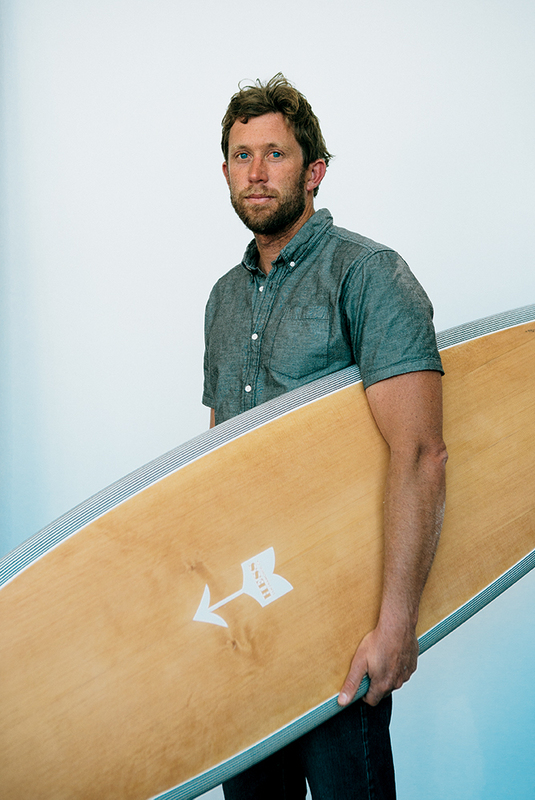 Danny, a gentle giant of a man, speaks with a Zen-like calmness about his passion for shaping boards, which started at the age of 16 – “Rough, crude things in my parents’ garage.” Danny owned a sustainability driven design-build company for eight years, and has integrated the knowledge gained from this experience into creating Hess Surfboards. When asked about what the future holds for Woodshop, the guys each weigh in on a communal daydream of ideas. At the core of it are plans for a collaborative range of products under the Woodshop name. Whether those ideas materialize or not it’s clear that Woodshop is already a strong brand, which exists at the collective intersection of four creative friends. The products, much like their makers, are unique and well made, full of character, with a healthy amount of roughness at the edges.